The Exchange, originally uploaded by lightwriter27. Sometimes you get lucky when feature hunting and things look like they are not going to shape up to anything interesting. 3-year-old Jessa Ellis barters with Nancy Yates over the price of a doll at a warehouse yard sale for the Children’s Museum of Memphis. 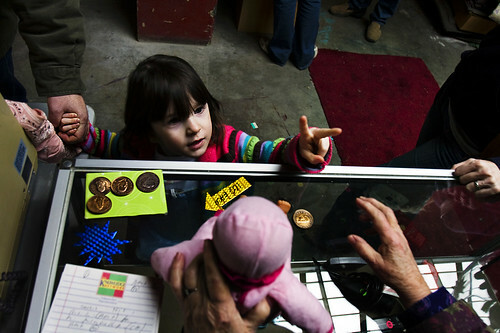 Grabbing collectible coins on the display counter, Ellis tried to bargain and purchase the doll for two coins until her parents decided to help and treat her to the toy with more up-to-date currency. The yard sale was put on by the children’s museum to clean out excess office furniture and toys in storage. All the proceeds benefit the museum’s educational exhibits and programs. this is a really, really great image. kudos.